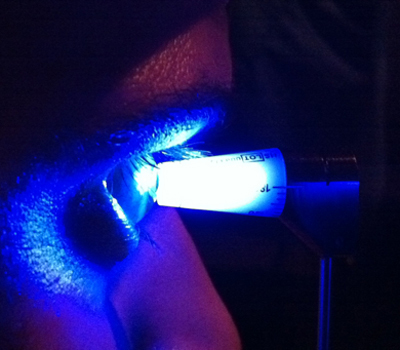 Intraocular pressure is measured every time you visit an eye doctor to assess the health of your eye. The eye is one of the few parts of your body that maintains its own pressure (your brain is another). The eye produces aqueous fluid to nourish the avascular (without blood vessels) parts of the eye, like the cornea (clear part in the front) and lens. This aqueous needs to drain from the eye in a controlled manner. 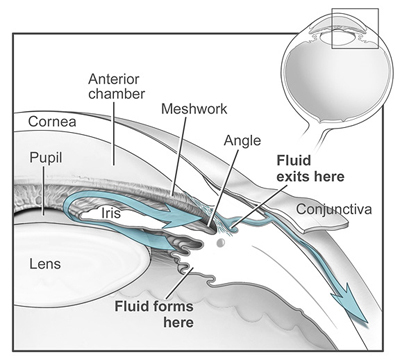 The fluid is made in the ciliary body, just behind the iris and drains from the eye through the trabecular meshwork which is in front to he iris. That way a flow of fluid is maintained that nourishes the eye structures. This also has the affect of keeping the eye inflated. If the eye did not have its own pressure, it would not properly maintain its shape and vision would decline. So, at each visit to the eye doctor, your intraocular pressure is measured to make sure the eye is healthy. All methods used in the doctors office involve touching the eye with a device. A drop of anesthesia is first placed in the eye so this won't hurt. Then the eye is touched with a device that is attached to a sensor that can tell how high or low the pressure is. Most offices use either a blue light device which is called applanation tonometry or a handheld device which is called a tonopen. Since the intraocular pressure fluctuates throughout the day, the time of measurement is usually recorded. Most people's intraocular pressure fluctuates 4 to 6 mmHg during the day. What is Normal Intraocular Pressure? Normal intraocular pressure is under 21 mmHg (millimeters of mercury). When the intraocular pressure gets higher than that, we worry about glaucoma. Glaucoma is a disease where high intraocular pressure can damage the optic nerve in the back of the eye. The reason this happens is because the little space where the optic nerve enters the eye is sensitive to high intraocular pressures. 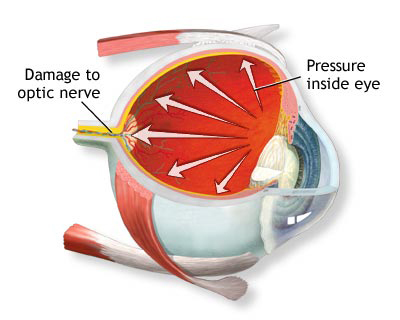 When the intraocular pressure is very high the nerve can be damaged quickly, sometimes in a few hours or days. When the intraocular pressure is a little high, the nerve can be damaged slowly. Optic nerve damage is not reversible. About one percent of people with an intraocular pressure under 21 mmHg have glaucoma and about 10 percent of people with an intraocular pressure over 21 have glaucoma. So, intraocular pressure is not the only thing that determines if someone has glaucoma. Sometimes the diagnosis of glaucoma can take many visits to the doctor and multiple tests in addition to intraocular pressure measurement. Why did my Intraocular Pressure Increase? As retina specialists, we perform many procedures and prescribe some medications that can cause the intraocular pressure to rise. Retinal surgery, intravitreal injections, and use of any type of steroid medications in the eye can cause a temporary elevation of intraocular pressure. If the optic nerve is healthy and the pressure rise moderate, it does not always have to be treated. But, if the optic nerve is not healthy (like in a person who already has glaucoma) or the intraocular pressure rise is significant (like over 30 mmHg), then topical pressure lowering or oral pressure lowering medications are usually prescribed. In addition, rarely, the intraocular pressure rise can be so dangerously high and not responsive to medical treatment that urgent pressure lowering surgery is recommended. There is some evidence that chronic intravitreal injections, like those given for age-related macular degeneration, causes intraocular pressure to increase in 10 percent of patients.